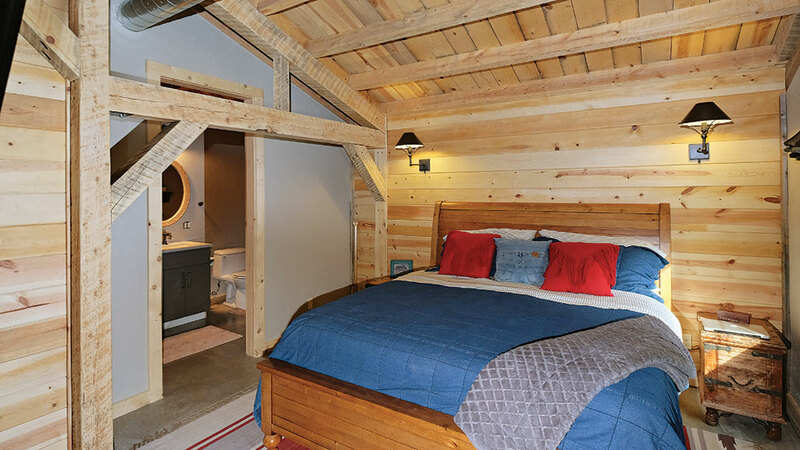 On any given day, Jack and Natalie Peetz are never sure who will walk through the front door of the weekend retreat they fondly refer to as “The Bunkhouse.” “It’s become a sort of neighborhood gathering place,” laughs Natalie. “We joke that at 5 o’clock on Friday, Jack’s Bar and Pub is where everyone comes to have a cocktail and kick off the weekend.” And the couple wouldn’t have it any other way. 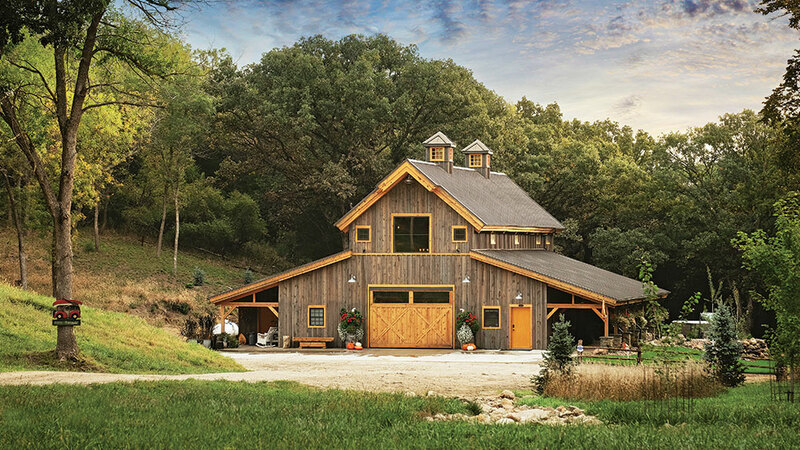 Wanting as many people to enjoy the house as possible, Jack and Natalie thoughtfully designed and outfitted the barn with entertaining in mind. 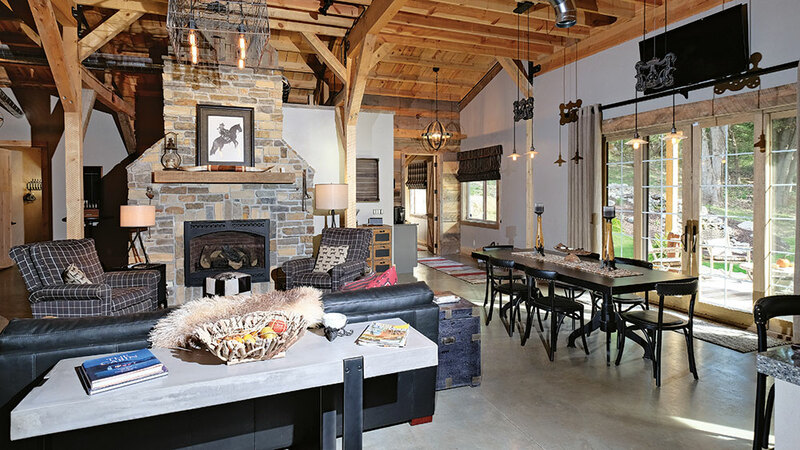 Two shared living areas dominate the home’s main floor. 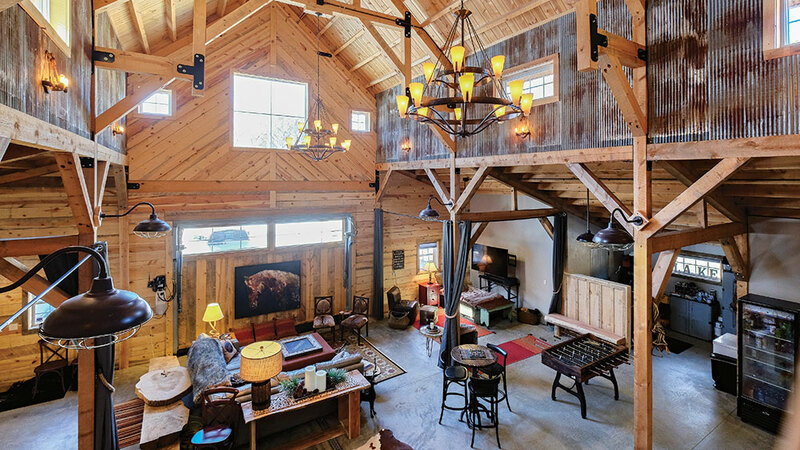 A kitchen, dining and family room fills on one side of the barn, while the opposite side includes a massive great room with a built-in bar, gaming area and TV space, complete with hydraulic lift doors and windows that open the indoors to the outside. 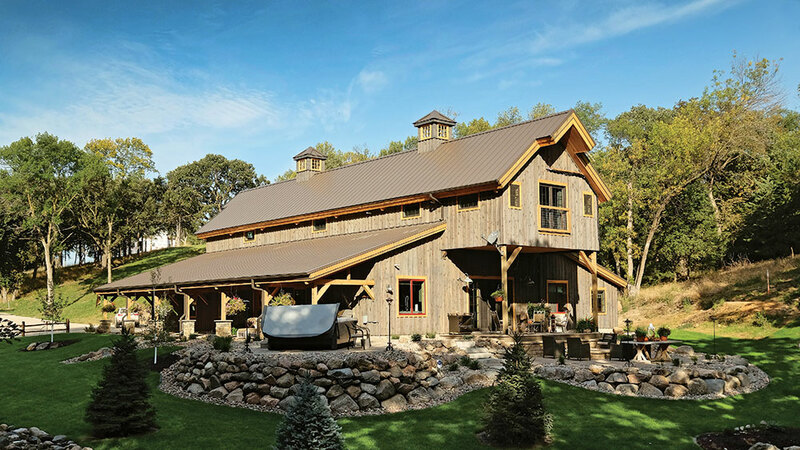 The style of this timber retreat —with its covered porches, lean-tos and cupolas — was inspired by a horse barn in the Grand Tetons. 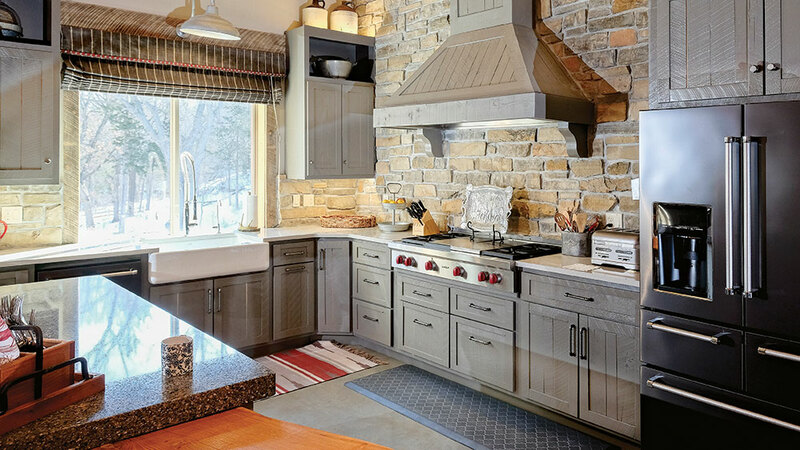 The kitchen is a cook’s dream, with stainless-steel appliances, a deep farmhouse sink and scads of a cabinetry and counter space. 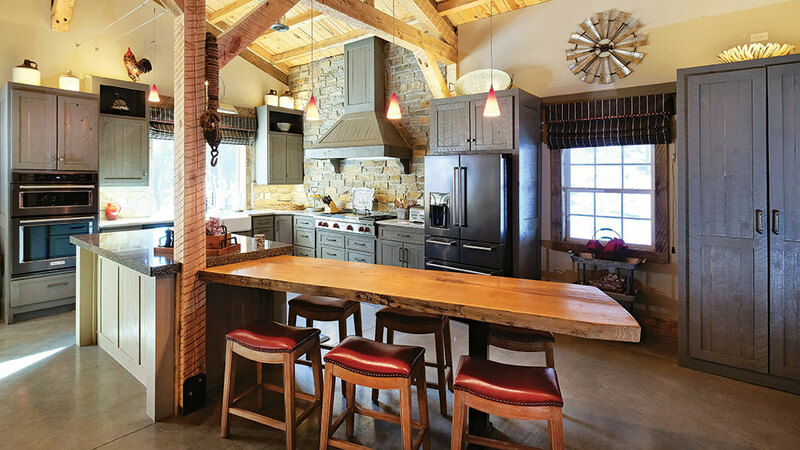 Connected to the granite-topped island, a huge oak slab table (fabricated from a tree felled on the property) is a popular spot for mingling and snacking. 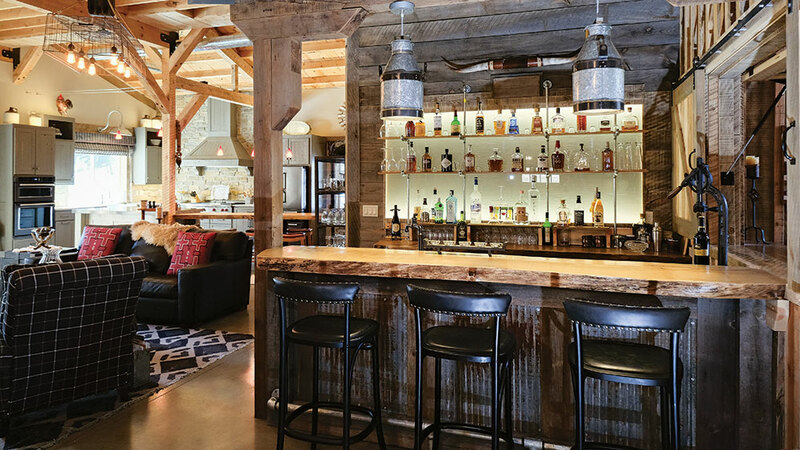 Layers of texture punctuate the home, including rough-hewn timbers, polished concrete floors, rusted corrugated tin panels and reclaimed barn wood. 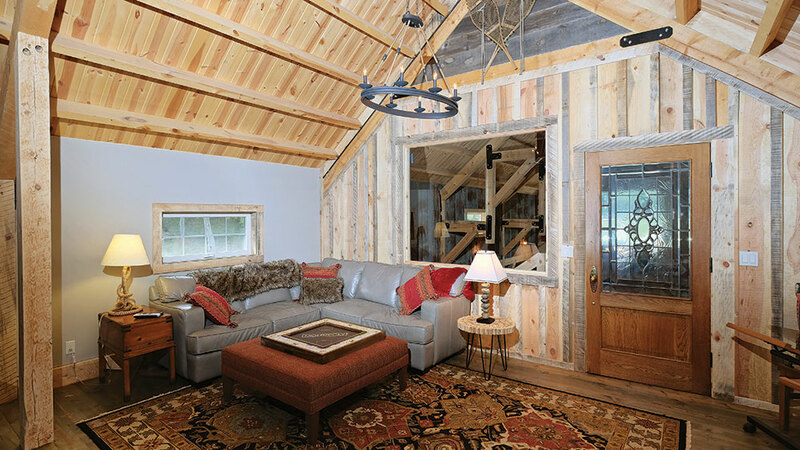 Thoughtful decorative details, like barn-style lighting, add to the interior’s rustic atmosphere. 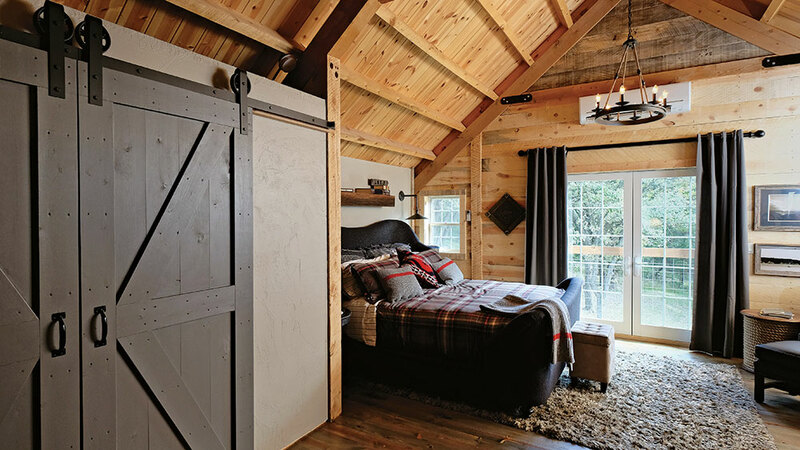 Touches of drywall in the bedrooms and beyond give the timber frame home a modern edge. “We wanted to include drywall to keep the spaces bright,” Natalie says. 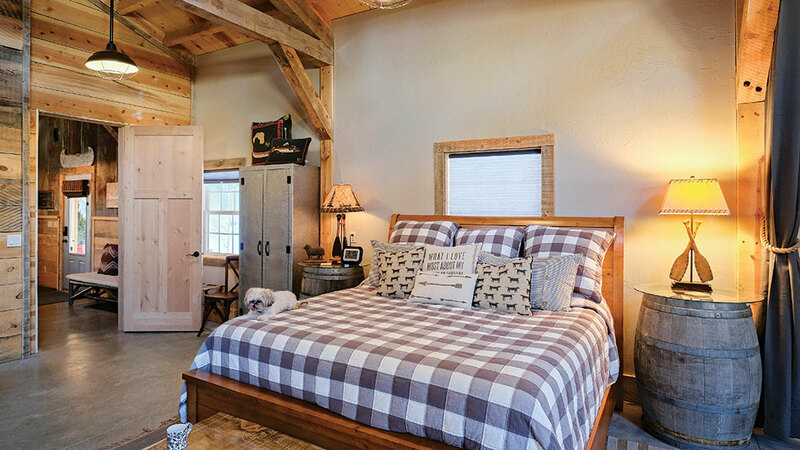 One of the home’s three master bedrooms, this one features sliding barn doors on either side of the room, reclaimed barn wood accents and a wagon-wheel style chandelier. Anchored by a stone fireplace, a pair of comfortable conversation chairs and a variety of textures step up the warmth of the living room. The outdoor living areas are inviting. An open-air patio, a covered porch and a lean-to that runs the length of the house practically demand the couple and their guests sit and stay awhile.